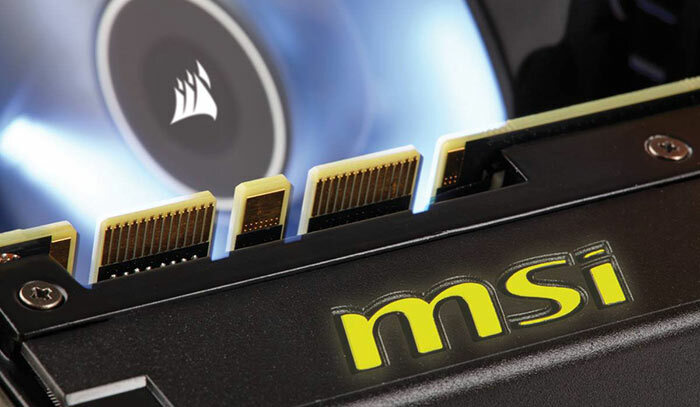 Today a new product was announced, forged from a collaboration between MSI and Corsair. Last week we saw it teased, and today the GeForce GTX 980Ti SEA HAWK was announced at the Tokyo Game Show 2015. As you might expect, the MSI GeForce GTX 980Ti SEA HAWK combines MSI's graphics card engineering with Corsair's cooling technology. 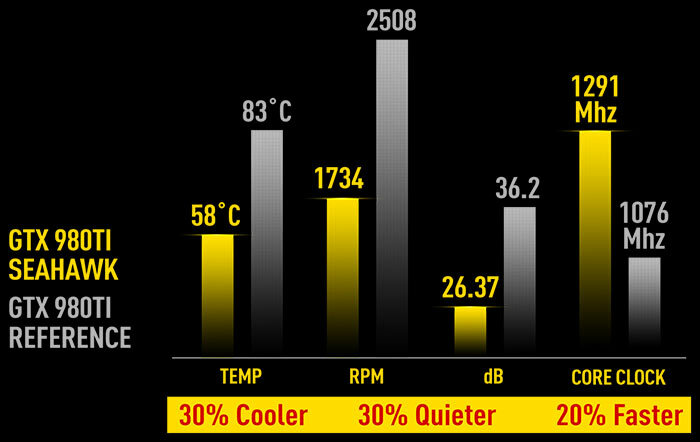 The particular cooler put to duty in this device is the Corsair H55 closed loop solution. Coarsair's cooler features a micro-fin copper base to facilitate efficient heat transfer. The H55 uses a high-speed circulation pump, an easy to install low-profile aluminium radiator plus a variable speed super silent 120mm fan. Another fan, built into the graphics card shroud, provides air cooling for the other critical components of the graphics card. As we postulated when teased by MSI last week, thanks to being equipped with a hybrid cooler, the GeForce GTX 980Ti SEA HAWK can run at much faster clock frequencies than standard GeForce GTX 980Ti variants. I've embedded the key technical specs table below for you to look over. Though it boasts excellent speeds out of the box, users interested in pushing the card further need only turn to the supplied MSI Afterburner overclocking utility. Afterburner features tweaking possibilities that include Triple Overvoltage, custom profiles and real-time hardware monitoring as well as its own in-game FPS counter overlay so you can see the impact of your overclocks. Interestingly Corsair looks like it is promoting the same graphics card as the 'HYDRO GFX'. You can see Corsair's product page here. 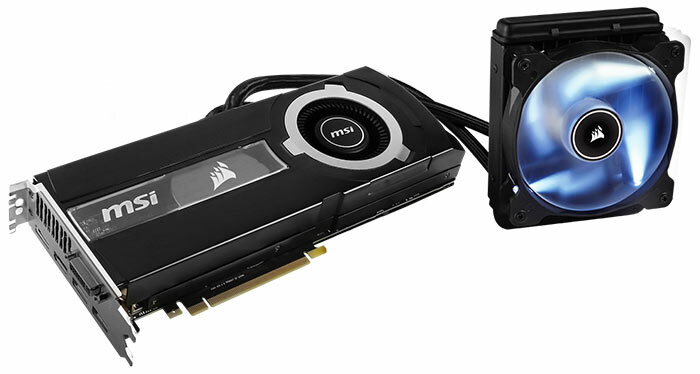 Corsair's SKU is pictured side by side with the MSI boxed product below. Availability is said to be immediate (for the MSI branded product), and recommended pricing is US$739.99. Nvidia intros GeForce GTX 1650 GPU Asus Nvidia GeForce GTX 1650 Ti graphics cards listed by EEC Corsair launches Ironclaw RGB Wireless gaming mouse Dell XPS 15 to get latest Intel and Nvidia processors in June QOTW: What wattage is your power supply?